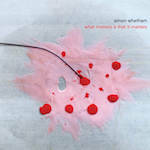 The UK’s Whetham has been producing albums for over ten years now. His latest on the French experimental label, Baskaru, follows many a path he has trodden before; and why break something that doesn’t need fixing? With a collection of titles that befit the length of the songs they represent; opener ‘Things Just Fall Where They Want to’, covers a wide-ranging space of ambience that for the most part is uplifting and refreshing. It takes a while however for the track that follows (‘One Side of the Border’), to come to life. This is mainly due to Whetham’s obsession with field recordings; but luckily he does piece these together cohesively enough, as not to deter the listener. The title track itself, is an exercise in Drones, Dark Ambient and gutter driven noise. I am a fan of all three; and Simon turns everything on its head, with a barrage of brutality and visceral sonic rage. ‘The Innocence of Deceit ‘ follows much on the same path, albeit more sparse. The rest of the album delves into paranoid ambience, field recordings and music with a great feel for spatial and sonic awareness. Overall, Whetham has produced a dramatic album that is completely misrepresented by its artwork; and should be a terrifying surprise to those who are invited in by the cover alone. Enjoyable and interesting from start to finish, there is much on here to tempt me to check out previous output. This entry was posted in Baskaru, Dense Promotion. Bookmark the permalink.